It’s a question that’s perplexed philosophers for centuries and scientists for decades: Where does consciousness come from? We know it exists, at least in ourselves. But how it arises from chemistry and electricity in our brains is an unsolved mystery. Neuroscientist Christof Koch, chief scientific officer at the Allen Institute for Brain Science, thinks he might know the answer. According to Koch, consciousness arises within any sufficiently complex, information-processing system. All animals, from humans on down to earthworms, are conscious; even the internet could be. That’s just the way the universe works. What Koch proposes is a scientifically refined version of an ancient philosophical doctrine calledpanpsychism — and, coming from someone else, it might sound more like spirituality than science. But Koch has devoted the last three decades to studying the neurological basis of consciousness. 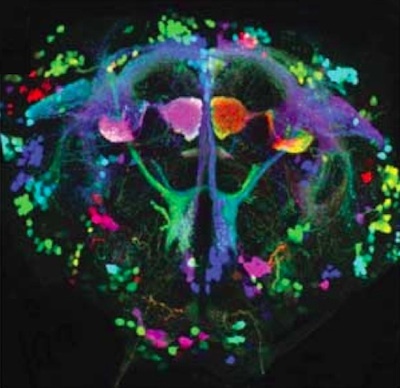 His work at the Allen Institute now puts him at the forefront of the BRAIN Initiative, the massive new effort to understand how brains work, which will begin next year. Koch’s insights have been detailed in dozens of scientific articles and a series of books, including last year’s Consciousness: Confessions of a Romantic Reductionist. WIRED talked to Koch about his understanding of this age-old question. WIRED: How did you come to believe in panpsychism? Christof Koch: I grew up Roman Catholic, and also grew up with a dog. And what bothered me was the idea that, while humans had souls and could go to heaven, dogs were not suppose to have souls. Intuitively I felt that either humans and animals alike had souls, or none did. Then I encountered Buddhism, with its emphasis on the universal nature of the conscious mind. You find this idea in philosophy, too, espoused by Plato and Spinoza and Schopenhauer, that psyche — consciousness — is everywhere. I find that to be the most satisfying explanation for the universe, for three reasons: biological, metaphysical and computational. WIRED: What do you mean? Koch: My consciousness is an undeniable fact. One can only infer facts about the universe, such as physics, indirectly, but the one thing I’m utterly certain of is that I’m conscious. I might be confused about the state of my consciousness, but I’m not confused about having it. Then, looking at the biology, all animals have complex physiology, not just humans. And at the level of a grain of brain matter, there’s nothing exceptional about human brains. Only experts can tell, under a microscope, whether a chunk of brain matter is mouse or monkey or human — and animals have very complicated behaviors. Even honeybees recognize individual faces, communicate the quality and location of food sources via waggle dances, and navigate complex mazes with the aid of cues stored in their short-term memory. If you blow a scent into their hive, they return to where they’ve previously encountered the odor. That’s associative memory. What is the simplest explanation for it? That consciousness extends to all these creatures, that it’s an imminent property of highly organized pieces of matter, such as brains. WIRED: That’s pretty fuzzy. How does consciousness arise? How can you quantify it? It's not that any physical system has consciousness. A black hole, a heap of sand, a bunch of isolated neurons in a dish, they're not integrated. They have no consciousness. But complex systems do. And how much consciousness they have depends on how many connections they have and how they’re wired up. WIRED: Ecosystems are interconnected. Can a forest be conscious? Koch: In the case of the brain, it’s the whole system that’s conscious, not the individual nerve cells. For any one ecosystem, it’s a question of how richly the individual components, such as the trees in a forest, are integrated within themselves as compared to causal interactions between trees. The philosopher John Searle, in his review of Consciousness, asked, “Why isn’t America conscious?” After all, there are 300 million Americans, interacting in very complicated ways. Why doesn’t consciousness extend to all of America? It’s because integrated information theory postulates that consciousness is a local maximum. You and me, for example: We’re interacting right now, but vastly less than the cells in my brain interact with each other. While you and I are conscious as individuals, there’s no conscious Übermind that unites us in a single entity. You and I are not collectively conscious. It’s the same thing with ecosystems. In each case, it’s a question of the degree and extent of causal interactions among all components making up the system. WIRED: The internet is integrated. Could it be conscious? Koch: It’s difficult to say right now. But consider this. 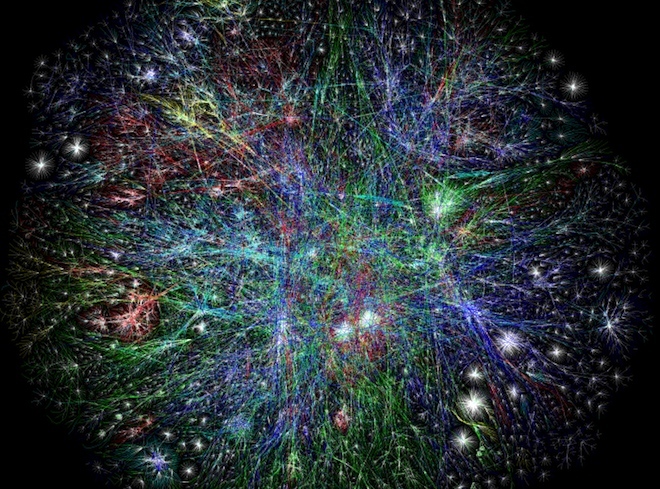 The internet contains about 10 billion computers, with each computer itself having a couple of billion transistors in its CPU. So the internet has at least 10^19 transistors, compared to the roughly 1000 trillion (or quadrillion) synapses in the human brain. That’s about 10,000 times more transistors than synapses. But is the internet more complex than the human brain? It depends on the degree of integration of the internet. For instance, our brains are connected all the time. On the internet, computers are packet-switching. They’re not connected permanently, but rapidly switch from one to another. But according to my version of panpsychism, it feels like something to be the internet — and if the internet were down, it wouldn’t feel like anything anymore. And that is, in principle, not different from the way I feel when I’m in a deep, dreamless sleep. WIRED: Internet aside, what does a human consciousness share with animal consciousness? Are certain features going to be the same? Koch: It depends on the sensorium [the scope of our sensory perception —ed.] and the interconnections. For a mouse, this is easy to say. They have a cortex similar to ours, but not a well-developed prefrontal cortex. So it probably doesn’t have self-consciousness, or understand symbols like we do, but it sees and hears things similarly. In every case, you have to look at the underlying neural mechanisms that give rise to the sensory apparatus, and to how they’re implemented. There’s no universal answer. WIRED: Does a lack of self-consciousness mean an animal has no sense of itself? Koch: Many mammals don’t pass the mirror self-recognition test, including dogs. But I suspect dogs have an olfactory form of self-recognition. You notice that dogs smell other dog’s poop a lot, but they don’t smell their own so much. So they probably have some sense of their own smell, a primitive form of self-consciousness. Now, I have no evidence to suggest that a dog sits there and reflects upon itself; I don’t think dogs have that level of complexity. But I think dogs can see, and smell, and hear sounds, and be happy and excited, just like children and some adults. Self-consciousness is something that humans have excessively, and that other animals have much less of, though apes have it to some extent. We have a hugely developed prefrontal cortex. We can ponder. WIRED: How can a creature be happy without self-consciousness? Koch:: When I’m climbing a mountain or a wall, my inner voice is totally silent. Instead, I’m hyperaware of the world around me. I don’t worry too much about a fight with my wife, or about a tax return. I can’t afford to get lost in my inner self. I’ll fall. Same thing if I’m traveling at high speed on a bike. It’s not like I have no sense of self in that situation, but it’s certainly reduced. And I can be very happy. WIRED: I’ve read that you don’t kill insects if you can avoid it. Koch: That’s true. They’re fellow travelers on the road, bookended by eternity on both sides. WIRED: How do you square what you believe about animal consciousness with how they’re used in experiments? Koch: There are two things to put in perspective. First, there are vastly more animals being eaten at McDonald’s every day. The number of animals used in research pales in comparison to the number used for flesh. And we need basic brain research to understand the brain’s mechanisms. My father died from Parkinson’s. One of my daughters died from Sudden Infant Death Syndrome. To prevent these brain diseases, we need to understand the brain — and that, I think, can be the only true justification for animal research. That in the long run, it leads to a reduction in suffering for all of us. But in the short term, you have to do it in a way that minimizes their pain and discomfort, with an awareness that these animals are conscious creatures. WIRED: Getting back to the theory, is your version of panpsychism truly scientific rather than metaphysical? How can it be tested? Koch: In principle, in all sorts of ways. One implication is that you can build two systems, each with the same input and output — but one, because of its internal structure, has integrated information. One system would be conscious, and the other not. It’s not the input-output behavior that makes a system conscious, but rather the internal wiring. The theory also says you can have simple systems that are conscious, and complex systems that are not. The cerebellum should not give rise to consciousness because of the simplicity of its connections. Theoretically you could compute that, and see if that’s the case, though we can’t do that right now. There are millions of details we still don’t know. Human brain imaging is too crude. It doesn’t get you to the cellular level. The more relevant question, to me as a scientist, is how can I disprove the theory today. That’s more difficult. Tononi’s group has built a device to perturb the brain and assess the extent to which severely brain-injured patients — think of Terri Schiavo — are truly unconscious, or whether they do feel pain and distress but are unable to communicate to their loved ones. And it may be possible that some other theories of consciousness would fit these facts. WIRED: I still can’t shake the feeling that consciousness arising through integrated information is — arbitrary, somehow. Like an assertion of faith. Koch: If you think about any explanation of anything, how far back does it go? We’re confronted with this in physics. Take quantum mechanics, which is the theory that provides the best description we have of the universe at microscopic scales. Quantum mechanics allows us to design MRI and other useful machines and instruments. But why should quantum mechanics hold in our universe? It seems arbitrary! Can we imagine a universe without it, a universe where Planck’s constant has a different value? Ultimately, there’s a point beyond which there’s no further regress. We live in a universe where, for reasons we don’t understand, quantum physics simply is the reigning explanation. With consciousness, it’s ultimately going to be like that. We live in a universe where organized bits of matter give rise to consciousness. 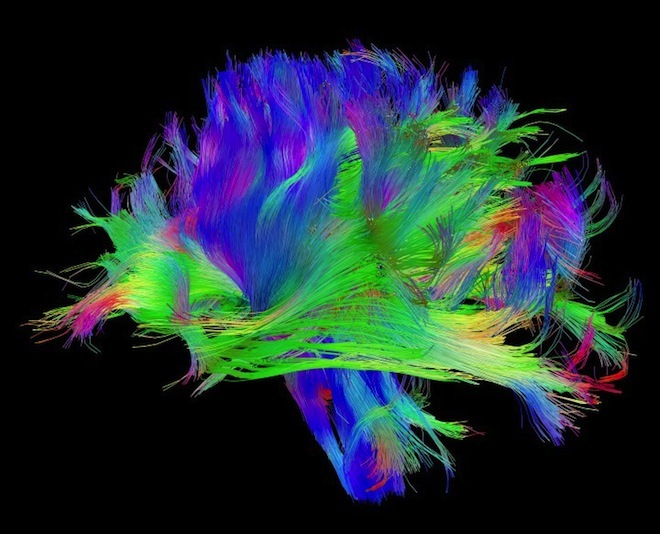 And with that, we can ultimately derive all sorts of interesting things: the answer to when a fetus or a baby first becomes conscious, whether a brain-injured patient is conscious, pathologies of consciousness such as schizophrenia, or consciousness in animals. And most people will say, that’s a good explanation. If I can predict the universe, and predict things I see around me, and manipulate them with my explanation, that’s what it means to explain. Same thing with consciousness. Why we should live in such a universe is a good question, but I don’t see how that can be answered now. L’impression 3D, c’est facile ! Des robots soldats pour prendre la relève? 8% des acheteurs français font du "showrooming"
Vers des liseuses subventionnées ?